Marie and I got back to my house last night, but I was just too tired to do a blog post. And you know none happened while I was at the Celebration. It's probably my favorite weekend of the year, but it's pretty much non-stop from 6 am to 11 pm every day, and I'm pooped. This will give you a fast overview of what the weekend is like. I shared some good pictures from several hikes on Facebook, so I won't repeat those here. 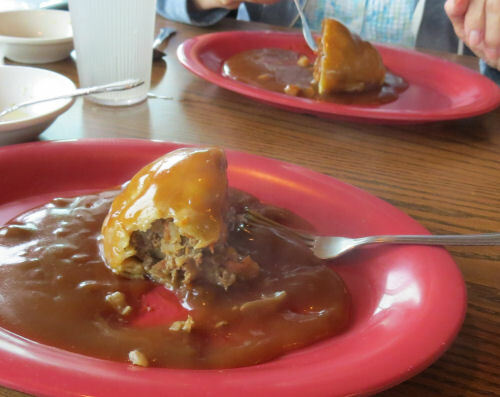 For starters, we had to get a real UP pastie, so we stopped on the way to Marquette, MI, at a place I know that makes good ones. We split one, since they are always big. 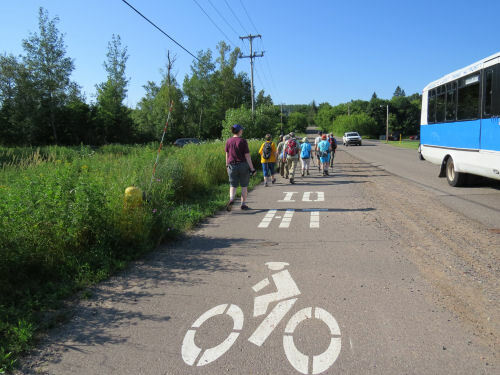 Thursday, we chose the Iron Ore Heritage Trail hike. It's a multi-use trail (lots in the woods, although this picture is beside a road), and we had good interpreters who told us the history of the area as we walked. Iron mining was the primary industry. 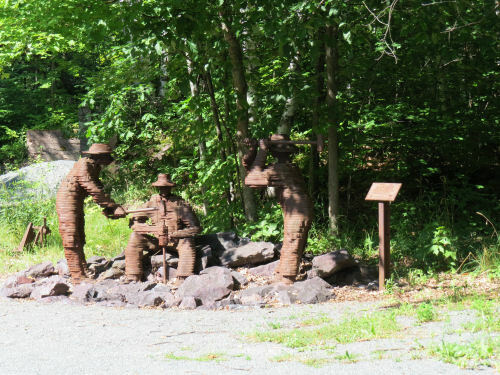 This sculpture commemorates the very early miners who used "double-jacking" to drill holes in the rock for the dynamite. That means there were two men with sledge hammers and they took turns hitting the drill to drive it. Usually a young boy was chosen to hold the drill because his hands were less valuable than the men's. That night, the National Park Service gave out the volunteer hour awards. This trail would never be built without volunteers. We are up to an impressive list of people who have donated over 1000 hours to the trail. 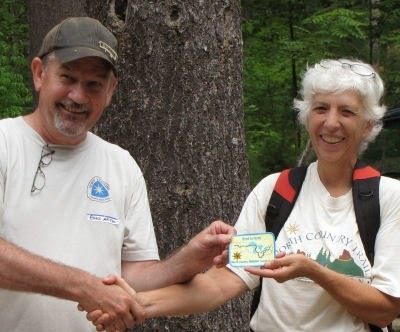 Quite a few have made it to the 4000 hour level (I'm one of those), and now there are actually five people who have each volunteered 10,000 hours for the trail! 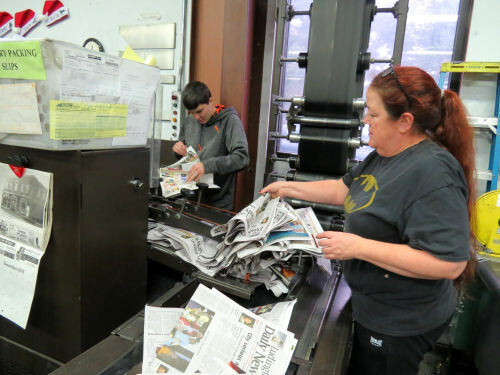 Tracking and reporting the hours is important, because the value is calculated and can impact how many federal dollars we receive. We also heard a presentation about the Porcupine Mountain Wilderness State Park. 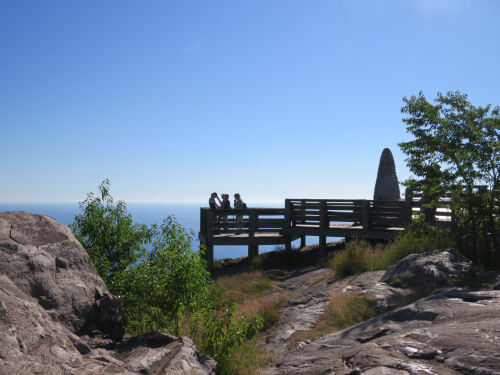 The NCT goes through there, and as part of the program it was announced that our trail is being re-routed to now follow the Escarpment Trail and to see Lake of the Clouds. I've been rooting for this change for years, so I am happy! Friday morning, we did a half-day hike to climb Sugarloaf Mountain. The sun on Lake Superior was dazzling. In the afternoon there was a large selection of seminars and talks, of which you could choose three. I went to one to learn about the current state of mapping the trail, and then one about Trail Towns. 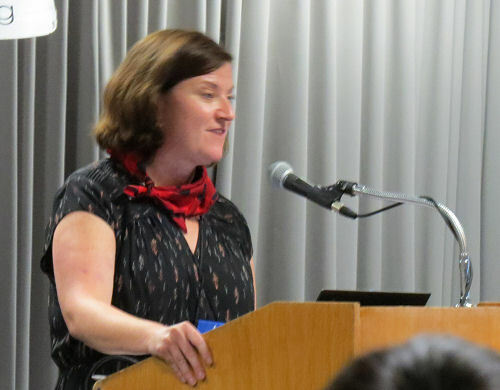 In the final slot, I led a panel discussion about planning a long hike on the NCT. The evening program included the NCTA Volunteer awards, which are another important way volunteers are recognized. 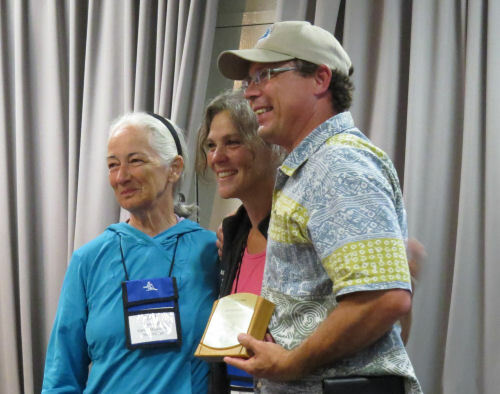 Here, John and Dove Day (where I went to the campfire two weekends ago) receive the Outreach Award for this year. 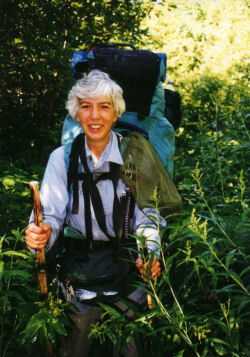 The lady in the blue shirt is Ruth Dorrough, whom I've hiked with as often as possible. She's our current board president. 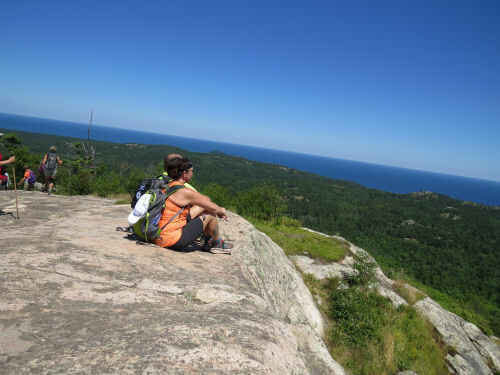 She and husband, Dan, completed their End-to-end hike last year. 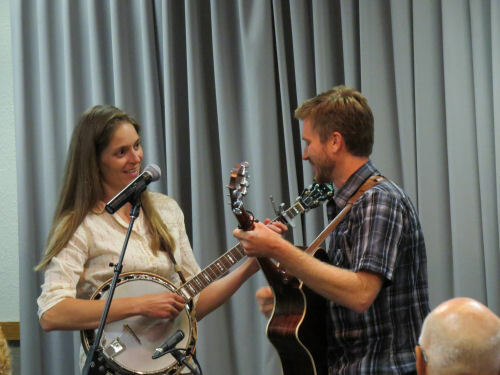 The program was about the history of how the Appalachian Trail was developed, followed by some music by the speaker and her husband. Saturday we went on a long hike again, which included Hogback Mountain. 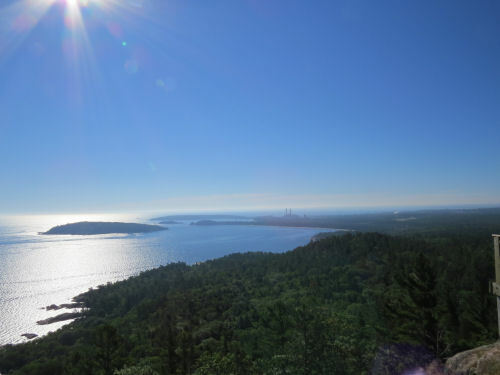 The terrain was mostly easy, along Lake Superior, except for the one steep climb up Hogback, to 360-degree views. The final program was about the Iron Belle Trail. After that we had a collective bittersweet moment. Our Executive Director for the past 10 years, Bruce Matthews, retired. 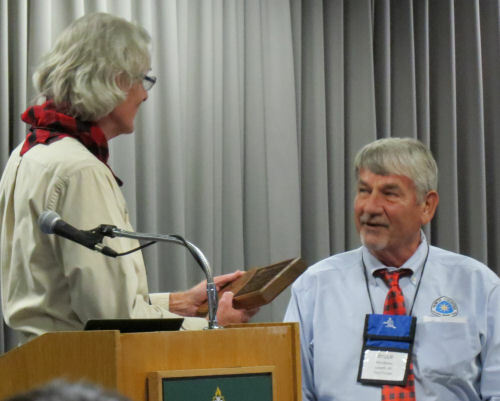 He's the one in the blue shirt, and he's being given recognition by Mark Weaver, our Park Service Superintendent. Our new ED will be Andrea Ketchmark, who will move up from the position of Director of Trail Management. We know she'll do a great job too! These conferences/celebrations are so important to me. This is where I get to see and interact with bunches of people who all love this same trail I do, the North Country National Scenic Trail. Bedtime now. I have to work in the morning, and Marie heads home. Hey, if you are gonna strip, it's nice to have a friend to do it with. 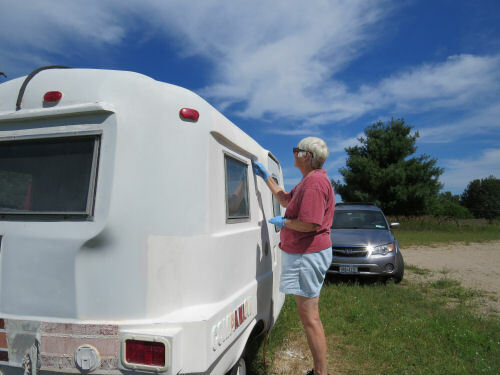 Marie and I worked on the trailer a little bit, but we also had final errands and tasks to do to get ready for the conference. 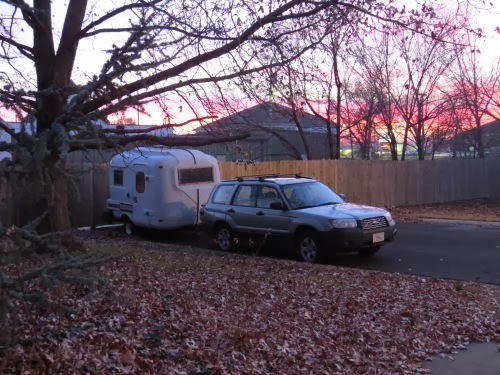 In January, I reserved a campsite for this trip, expecting we'd be taking the trailer. Ha! We've slept in tents for years. I think we can do it for one more weekend. But it was a lot of fun having her participate in this refurbishing, even if only a little bit. We had hopes of re-hanging the door today, but that didn't happen. 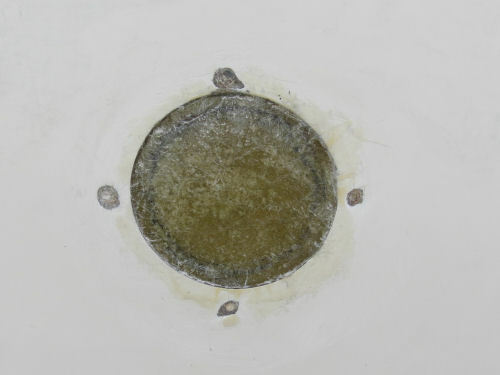 The hinge screws are rusted and frozen. They are soaking in Liquid Wrench as we speak. We'll have one more day here after the conference. Maybe we'll have time then unless I end up having to drill the screws out. I wanted to get the stripping a quarter done before this weekend. I think I made it, although it's not all on this one side. There is still a bit on the door and three letters to do. I did a whole lot yesterday by myself. However, there is the big patch of roof done that I started with, and we got the stripes off half the back. Here's another mystery. These ones came off really easily, while the earlier ones were horrible. It must just be the differences in how the paint weathered. I also got the backing piece of fiberglass done on the final hole in the side, and filled the screw holes around the earlier patches. There are a few dings to sand out and patch, but at least nothing can leak while I'm gone. The car is mostly packed and we are off to Marquette in the morning! Marie is here. I am happy. She's really tired after all that driving, so we aren't up to pictures tonight. 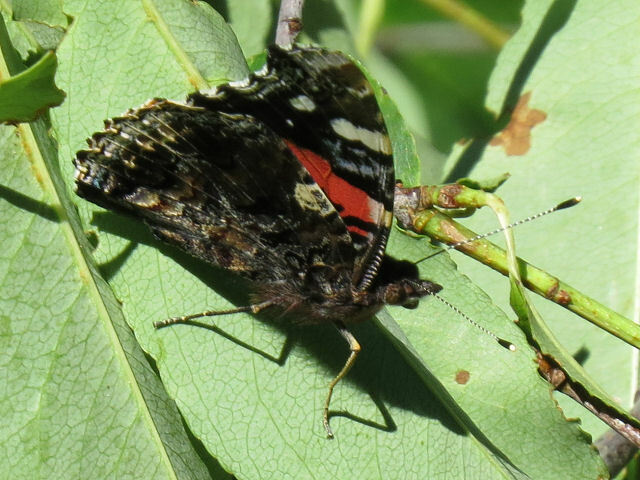 Instead, I'll show you another picture of a Red Admiral butterfly, Vanessa atlanta, at rest. If you want to see one with its wings open, follow the link below. Tomorrow there will be stuff to show you (probably)! A few years ago, I was pretty excited to show you that I found a mature American Chestnut on the Finger Lakes Trail in New York. It even produced fruit. The inner loop of the Dry Hill Trail that I hiked last weekend is called the Chestnut Loop because there are many sprouts of Chestnut Trees. 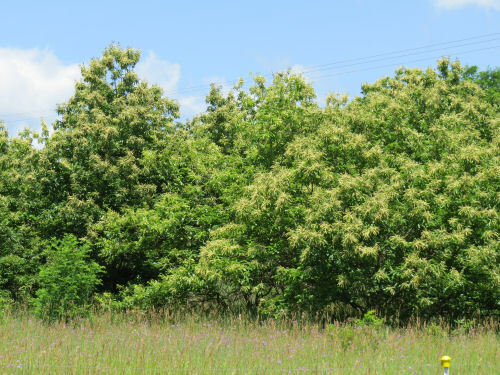 These are all offspring of native American Chestnut trees that were planted by early settlers. The natural range of the tree does not extend this far north. Almost all the American Chestnut trees were killed by a fungal blight in the early part of the 20th Century. The trees still try to sprout from old stumps and roots, but rarely live more than a few years. Here's one that it giving it the old college try. Sadly, this is what happens. Instead of growing into tall trees, they turn into weedy clumps that die before they are ten years old. 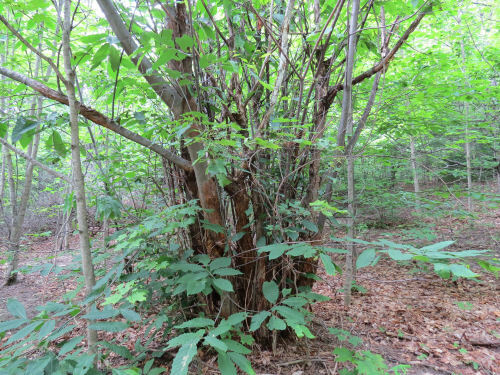 Supposedly, before the big die-off, the Chestnut accounted for about a quarter of all trees in the eastern forests, with the natural range being on the west and north edges of the Appalachian Mountains. The nuts were the main food source for many animals, the way acorns are today. Between 3 and 4 billion trees died. It's hard to imagine how different the forests must have been back then. Or how different they will become. In another 50 years, the Ash will all be gone from today's forests, and the Beech will be well on their way out too, thanks to the emerald ash borer and beech bark fungus. 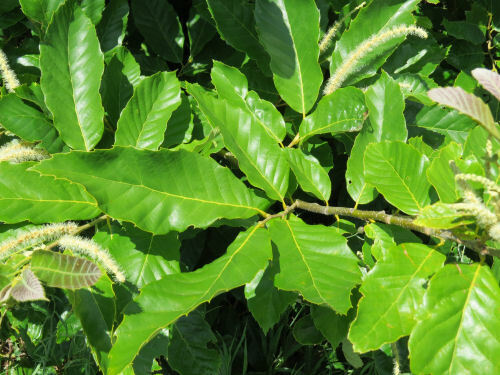 But Chestnut trees are really showy when in flower. They would have made the woods look quite different. 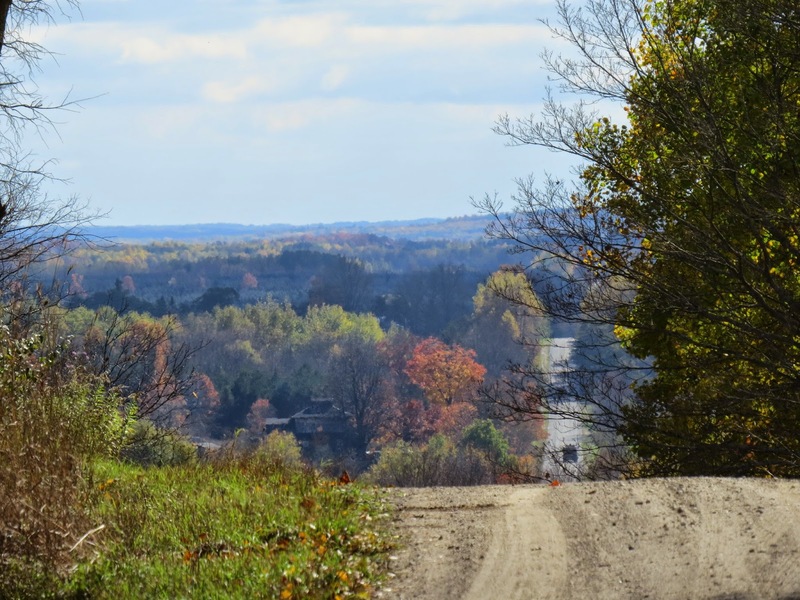 There are 600-800 mature Chestnuts that have survived in Missaukee County, Michigan (just east of Cadillac), and some on Beaver Island. 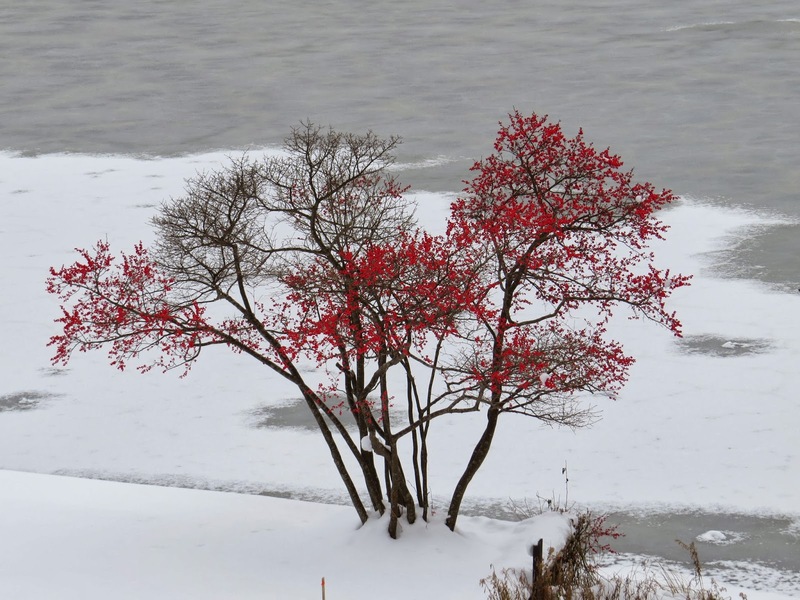 The blight does not like the colder climate of the north, and most living mature trees are in areas with cold winters. That said, a few remaining trees have been found in Kentucky, New Hampshire, Tennessee, Georgia, Wisconsin, Alabama, Ohio, Pennsylvania, Virginia, and planted ones in Oregon, Nova Scotia and Ontario. There are several foundations working to crossbreed resistant trees or make trees more genetically resistant to the fungus. So, where I'm going with this is that while driving home I saw a whole row of chestnut trees in bloom. They aren't huge, but they are larger than the shrubby messes above. I assumed they were Chinese Chestnut, but I stopped to take some pictures. Now I think they could be American Chestnuts or possibly a hybrid. Chestnuts are promiscuous. 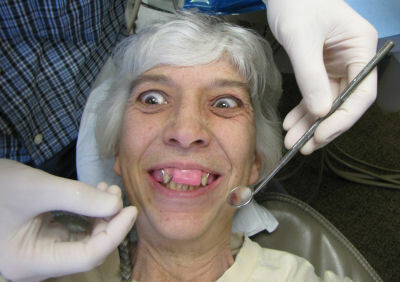 Looking at the pictures, the leaves seem to be broad with large coarse teeth like the American trees. Castanea dentata: "teeth." 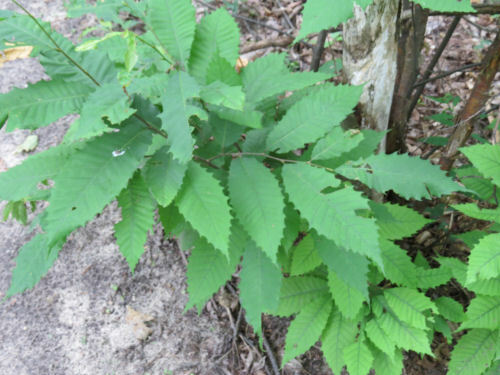 Chinese Chestnut has narrow leaves and finer teeth. That said, if they are a hybrid, I really wouldn't know how to tell. In fact, genetic testing might be required. But, they were in bloom. You can see how showy they are! 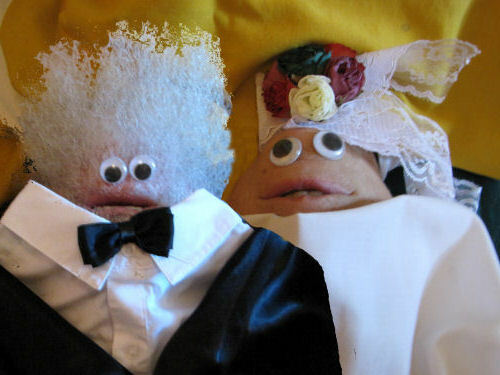 Both sexes are found on the same tree, but they do need more than one tree to pollinate. 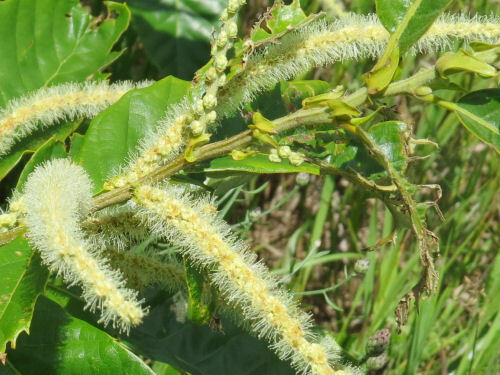 The long "feathers" are the male catkins, and the small female flowers are close to the stem. Pretty cool! Wouldn't it be neat if the chestnut came back just in time to take over for the ash or beech? Today I decided to take on the Big Hole. In the end, I didn't do it the "correct" way, but I'll tell you why. And, it's not done, but the filling has begun. First of all, let me remind you that this is Saturday, and I always give myself a free pass after working all night Friday night. I don't do anything I don't want to do. I probably had time to do more than I did, but at least I did something. So, this is the hole that was left behind the air conditioner unit after I finally got that whole thing out. It's covered with plastic in this picture which is why you can't see grass and trees, but it measures 11" x 20". Big. The store finally restocked the fiberglass mat, so I now had all the things I needed again. Actually, it turned out that I could have gotten as far as I did today with the first package, but I didn't want to start until I had everything, in case I decided to keep going. 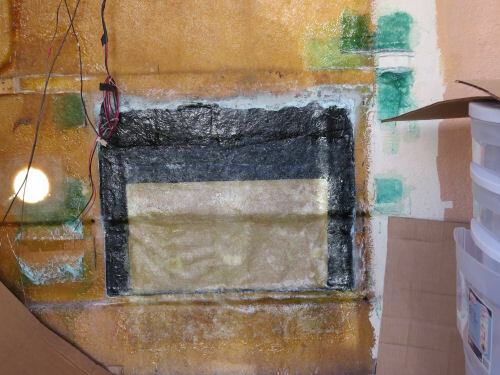 The proper way to do this is to get a cast of the outer surface with one layer and then remove that and build it up until you have a piece about the right thickness, and then fiberglass it into place. I was going to do that until I realized the hole went across the "bump" ridge of the stripes. I actually taped a backing piece into place to do this, but realized I'd never get that angle really right for the outside. So I decided to try it the same way I did the small holes. I made a cardboard cutout to fit in the hole, bending it to match the ridge, put it on another backing cardboard, and covered it with wax paper. 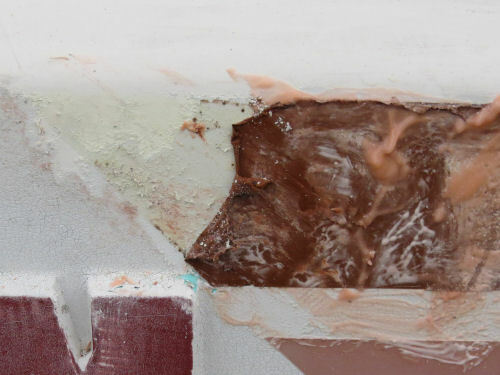 (See link below to Fiberglass 102 for more detail on doing this.) But I wasn't happy with the amount of give in this large piece. So I used the rod from a towel bar and wedged it tight into the angle. 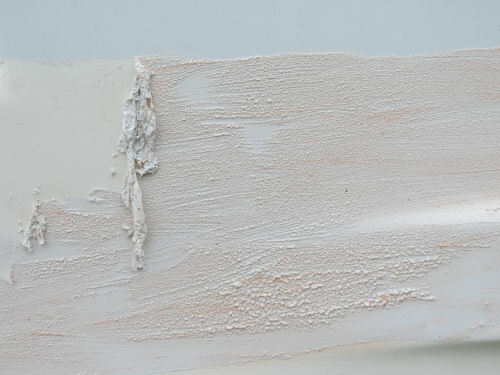 It was tricky working the resin into this large of a piece of fiberglass with angles, vertically. 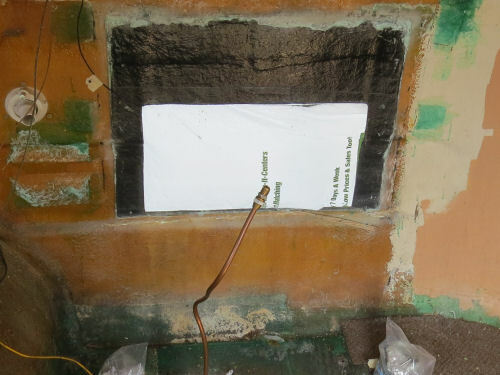 And the inside was very rough and irregular from cutting out that housing that had been fiberglassed to the wall. But none of that will show later. It wasn't looks I was worried about, it was air bubbles, and I did get some that I couldn't do anything about. Some I can fill when I start work from the outside, some not so much. Well, whatever I end up with has to be stronger than that big hole, right? So here's the initial mat with the resin worked in to hold it to the inside wall. Looks opaque because the cardboard is still on the exterior. You can see that the ridge definition is there toward the edges but gets lost a little near the middle. After it hardened, and I took the cardboard backing and wax paper off, well... same thing. Edges aren't bad, but the middle is sloppy. As I suspected, I couldn't really mold that shape vertically. Hope I can improve that as I build up the layers. But this initial layer is nice and hard, and ready to add more layers. You aren't supposed to do more than three at a time, but they only have to dry a couple of hours between times. I also sanded out divots around the screw holes that held all these vents and things on. They need just a small bit of fiberglass mat added. And there is one more small hole. If I'd remembered to get it ready I could have done it today, but I keep forgetting because it's up high (out of my line of sight). The screws holding the covering are all rusted and I had no patience left when I started to take them out. Another day. I also started to strip one more tiny area, but the paint is really tight, and it will need a second coat of stripper. I also think the stripper softens up the blades of the plastic scrapers. I broke one, and have softened two. I did buy a few extra because they are cheap, but it's just annoying. Again, patience gone. It's Saturday. I'm calling it a day. 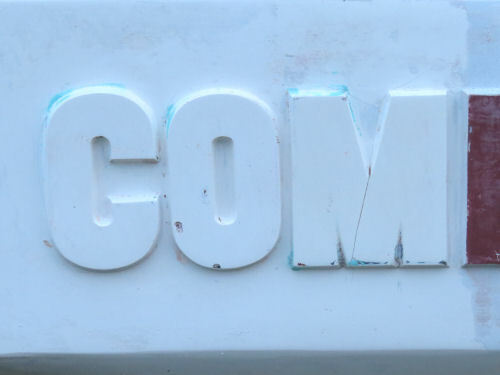 COM... ing with me? The letters aren't as hard to strip as I thought they would be. The stripes are much harder than I thought. Stripping the paint on my COM... panion is going to take pretty much as long as I thought. I just hope I'll be able to get it painted this summer. I sure wanted to get a lot more done than that. 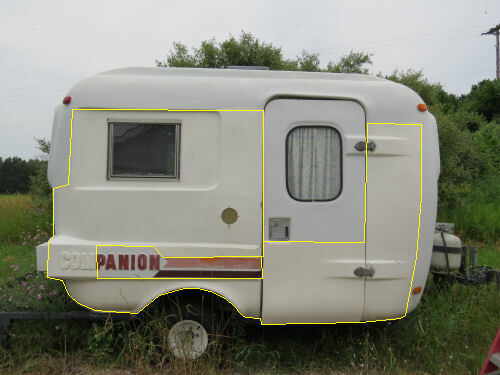 Again, I've outlined the completed parts in yellow. The part just above the wheel isn't done well enough, but I got rained out tonight. 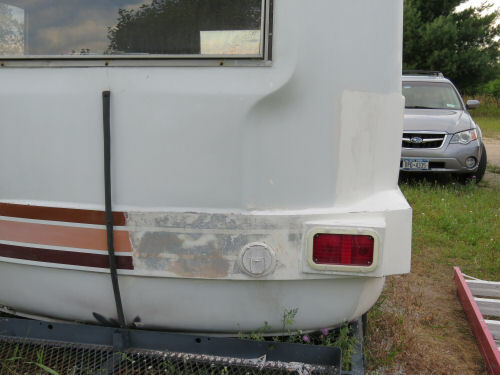 If you are reading this in search of info about trailer refurbishing, at this point, I've not quite used a quart of Citristrip. Did you catch that: COM... pleted? Being able to really say that is drifting off into the future. 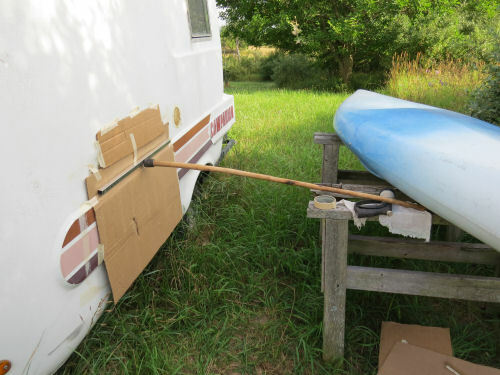 I had hoped the paint would come off like it is on the door. Here's a mystery. Same trailer, same container of stripper (yes, shaken before each use), same thickness of application. But on the door, the stripper bubbles up, and when I scrape the old paint just wipes right off. Now that would have been nice for all of it! The COM... plicated part is the stripes. They are some sort of tape. And I guess this answers the question about whether they were original. Not. The paint is under them. They are hard to get off. First I tried sanding. It worked, but was slow and was pitting the gel coat because I had to press so hard. Next I tried acetone. That gummed up the adhesive and it did work, but I had to use a lot. That's when I realized there was paint under the tape. So I slathered on an extra helping of stripper, let it sit, and the tape peeled off easily- mostly dissolved. Then I had to strip the paint under it. I'll do the final stripping close to window edges and hinges, etc when I take those pieces off. Since I am working outside, I don't want to take all those out/off until I'm ready to deal with the openings. I may have to buy a big tarp. COM... fortable? Not yet. The inside is still a mess of wood pieces, cardboard, tools and stuff. 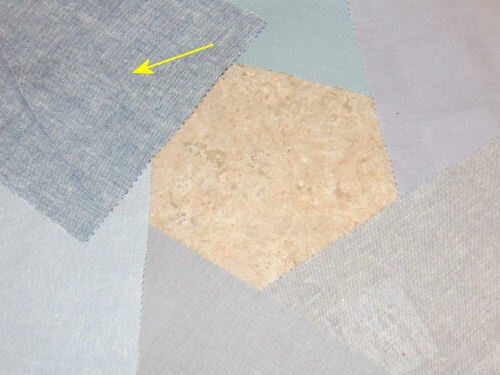 But the vinyl for the floor is ordered, and I've chosen the fabric for the shelving curtains. Had to spend a lot on swatches to get the right one, but I guess it was worth it. Certainly better than driving hours and visiting multiple fabric stores only to learn they don't have enough yardage left, right? I'll be ordering that this weekend. The one I chose has the yellow arrow. And, I'm contemplating a fix for the sprung door bottom. Don't have it all figured out yet, but I have an idea that might not be a COM... pletely horrible job. Also, one that I have tools for. I've seen one (and only one) fix for this problem, but it requires a metal shop and skills I don't have. Oh! And I have the fix for the "strike plate" (It isn't really that, but I'm not sure what to call it on this type of latch) figured out, and it's COM... paratively easy! I might have to find a friend with a larger vise than I have to bend some metal, but this is within my metalworking skills. 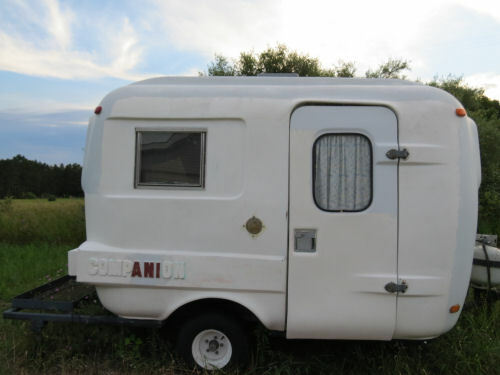 When I do finally get this on the road, I hope some of you are looking for some passive/aggressive COM... raderie, because I just might come mooch an electric outlet off you for a visit. I say passive/agressive, because I'm more of a hermit, you know! Yup, this is my 3000th blog post (on this blog). I'd previously been posting on Xanga, a sort of pre-blog platform, with some friends for several years, and then did a short-lived blog called "Niblets from the Shark" that was more personal. Then I had the brainstorm to take the "Quality Day" exercise and make it into a blog that other people might enjoy (If you don't know what this is about read What is My Quality Day?). This was in October of 2008. Nearly 10 years ago. Blogging was in it's heyday at that point, and I signed up with Entrecard, CMF, and later Adgetize. I started more blogs than I could possibly keep alive. I tried to make money. OK, I made a little. More on that later. I have met a lot of good friends from around the world through this blog. A significant number of us are still friends on Facebook, and a few have made the transition to real life friends. Are you ready for too many pictures and a bit of philosophy? An awful lot has happened in 10 years. 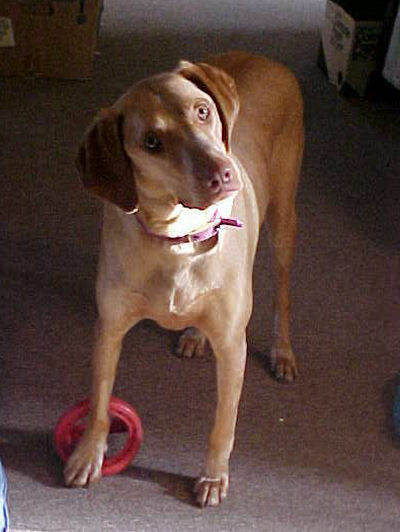 We had a dog, Maggie, and a cat,V-8, then. Now I have no pets. I never thought I'd live without a dog, but I want to travel, and society has little tolerance for people leaving dogs in vehicles any more. Even if the conditions are fine. When I began this blog adventure, I was completely self-employed. I had several accounts designing and maintaining web sites. All but one of those is now gone. People figured out you could make web sites on blog platforms for next to nothing and slowly, my customers faded away. I did a long stint of content writing. I wrote on a LOT of different sites. Mostly, I didn't enjoy it. The one exception to that was a site called Shared Reviews, where I was making the most money. I put too many eggs in that basket, and when it went belly-up, that hurt. But I still have a lot of Facebook friends from that adventure too. 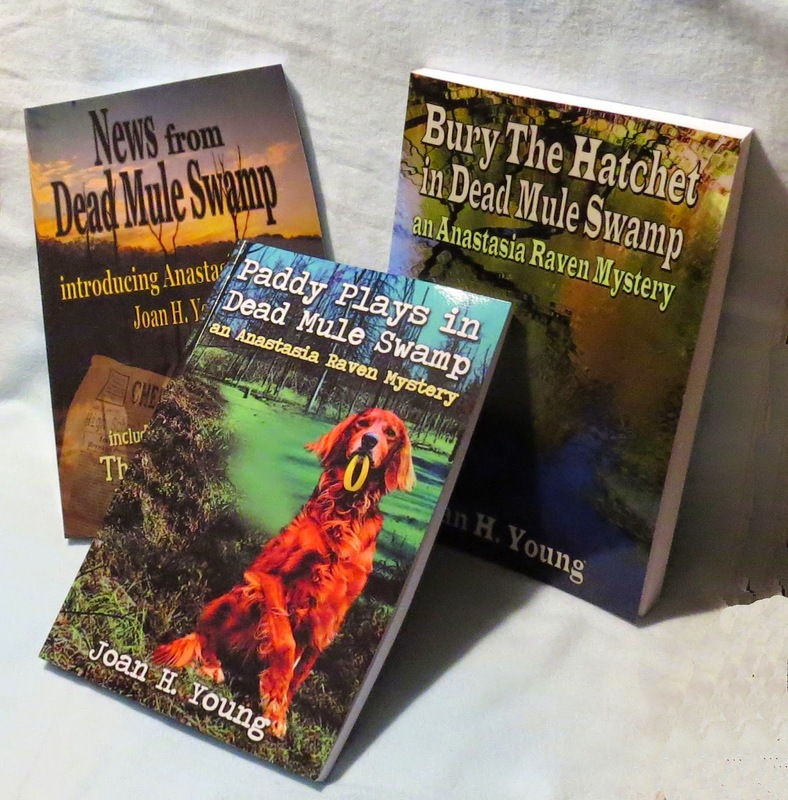 I started writing cozy mysteries. Now I am working on the fifth one! People seem to like my writing, and spending more time doing that is one of my future goals. I want to keep writing mysteries, finish the sequel to North Country Cache, write a technothriller, and some non-fiction. 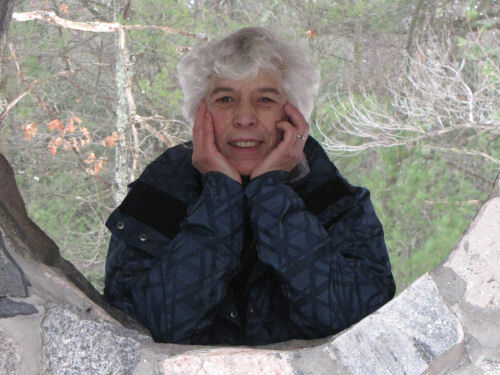 You've followed me as I completed a major goal, to hike all the miles of the North Country National Scenic Trail (the first woman to do so). I'm still in love with hiking and the North Country Trail. Lots of foot travel in my future for as long as I can walk. My health is good. You've heard about almost all the issues- a new partial plate (not nearly as good as the one it replaced, I'm sorry to tell you.) was made in 2009. I did get lymphangitis from a cat bite, and have also spent 3 years recuperating from a bacterial gut infection they never did identify, but I'm pretty much over the after-effects of the hefty antibiotics they gave me. Probably the only thing I haven't shared is that my left shoulder started coming out of joint after I fell on it in 2013. So now, both shoulders are shot. That has pretty much put the kibosh on my dream to do a long swim unless I get them repaired, which isn't likely. Other than that, I'm good to go! I still can't decide what to be when I grow up. But I'll try some adulting as an author for the next round. I have no idea how many miles I've hiked since 2008, but it's in the thousands. And I've learned hundreds of new plants. Thank goodness the number of uncompleted craft projects isn't quite that high. I've been through 5 cameras; 3 computers; 3 phones; 2 cars; gallons of yogurt, iced tea and soup; and one God. One. Yup, I'm one of those people. Praise the Lord, All Glory to Jesus. God is Good. Hope a bunch of you will come along with me to see what happens next!